Affordable Family Storage has experience in storing all kinds of personal belongings for people in Council Bluffs, IA. As a result, we know a thing or two about space saving in a storage unit. While our storage facilities offer more than enough space for a lot of your stuff, the more space you can save when you store the better. For instance, have thought about storing your clothes using vacuum-sealed bags? 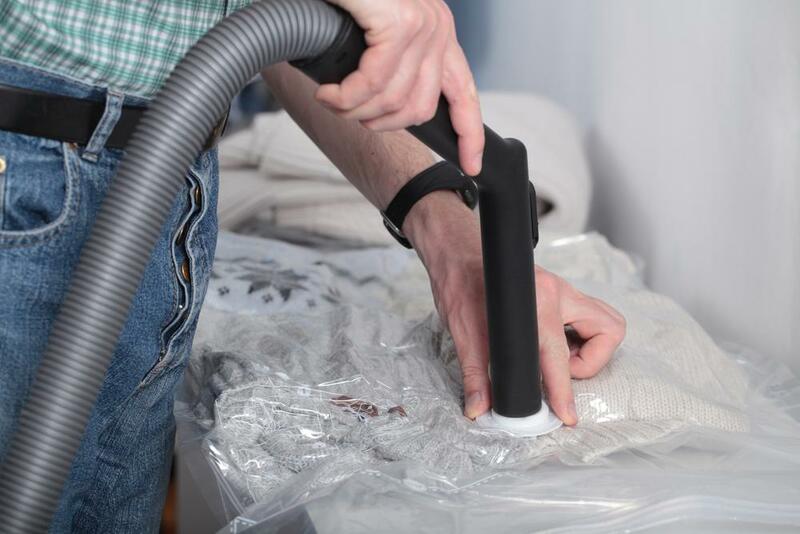 In this blog, Affordable Family Storage explains the benefits of vacuum-packing your clothing and gives you a brief how-to guide. You can buy bags designed for storing primarily clothes – typically known as “space bags” – in most major supermarkets. You can also easily find them online. When you’re packing clothes into space bags, make sure that you fold them first. Not only does this make things look neater, but it also helps conserve space inside the bag, makes things easier when it comes to removing the air, and stops your clothes from getting creased. You should also make sure that any clothes you put in the bags are dry. Washing them before packing them is a good idea, but packing even slightly damp clothes in a vacuum-sealed bag is asking for them to smell of mildew when it comes time to unpack them. Space bags also come with a designated “fill line”, which you need to pay attention to. Pack the bag to the line, but don’t overdo it. If you overstuff the bag, your clothes will get squashed and creased, and you’re probably going to lose some of that all-important airtight seal. When it comes to that airtight seal, space bags make it simple. Space bags come with a valve, usually at the bottom of the bag, that will fit the nozzle of a standard vacuum cleaner with all accessories removed. Unscrew the cap on the valve and attach the end of your vacuum cleaner, then turn it on. You’ll see the bag shrinking around the clothes you’ve put inside it. Once the bag is pulled tight against the contents, turn off the vacuum and remove it from the valve, then replace the cap tightly. Now your clothes are ready to store in your Affordable Family Storage storage unit! The advice from Affordable Family Storage is to keep things neat. With your clothes folded inside the space bags, your clothes can now be easily stacked and organized in storage in a way that not only keeps them in great condition but saves space for more stuff, too. If you’re looking for somewhere to store your stuff in Council Bluffs, IA, Affordable Family Storage has just what you need. We offer modern, secure, climate controlled storage of various sizes. Whether you’re vacuum-sealing your clothes, or storing larger household appliances like washers, dryers, and dishwashers, we can help. Contact our friendly customer service team about our storage facilitiestoday.